Our retail area is clean and ready for walk-in customers. At the fresh meat counter you can buy homemade smoked meats, sausages, and a variety of cheeses; along with fresh pork and beef, cut daily. We have a large variety of frozen products in our freezer section, including all frozen beef and pork cuts; along with lamb, buffalo, elk, fruit, fish, and variety meats. 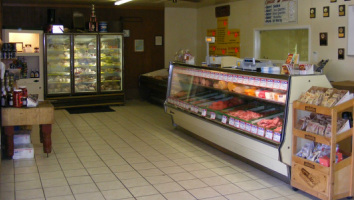 We sell sides and quarters of beef and whole or half hogs , along with freezer bundles for your home freezer. We also have a variety of steak sauces and seasonings to complement your meat selections. Below you will find our current price list for a variety of meat bundles we sell, along with current market price for beef sides, quarters or split sides and half or whole hogs (sold by hanging weight and cut to your specifications).